I use the clamp when I am not going to be able to drain my bladder frequently. This is during a road trip, movie, etc. I use catheters to dilate my urethra stricture. The plugs would occasionally blow out, causing a large wet spot in my pants. With the clamp, I have never had a leak through. Tried clamp on two catheters. Both times, the catheter failed to flow properly after several days of use...on the third cath, i discontinued using and went back to my solid plug, and cath had a good flow again for the normal amount of time. Easy to use. Lightweight. Sturdy. Safe. Easy Storage. Works great and easy to use with one hand. Did have to learn to move the closer from side to side a little when closing to make it easy as sometimes it doesn't line up.. but this is very minor. Clamp is a huge improvement over using the catheter plugs in the end. Easy to use. Stops spills. Using the clamps I was able to change my bags & also irrigate by myself, with no leaks. It really increased my independence. My dad has a bagless Catheter. He urinates about 6 or 7 times a day and sometimes the plug gets loose and he has accidents and wets all over himself. He only changes his Catheter once every six weeks. Would the clamp be ok for that ? Yes, the clamp will work for you. I'd suggest you use a plug in addition to help keep bacteria from entering the cath. 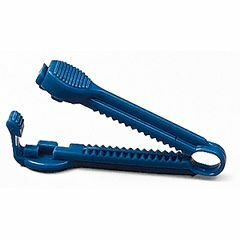 My spouse has demential and a enter catheter, is there anything that can prevent him from opening a clamp whenever he get ready. he has the tenancy to mess with the clamp i'm using. I can understand your problem. There is a product we call a "no-no mitten" we use in the hospital that should work. It's just a "mitten" that his hand would go in that has a rigid cut out that prevents the use of the thumb and opposing finger. It ties on the hand at the wrist. I would not suggest using it for long periods of time. It's a form of restraint. Someone at your local hospital or nursing home should be able to show you one.